With Love.....From All Of Us!! We are a family owned business,in the same location since 2006. 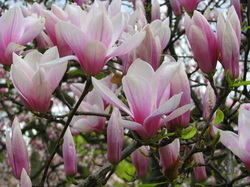 We assist you in designing a piece that will enhance home, office or be a special gift for friends or family. We handle with the utmost of care canvases, posters, photos and momentos. There are stories to be told in every project we create..let us tell yours. A fun poster to make us laugh at ourselves and the iconic characters of the day. 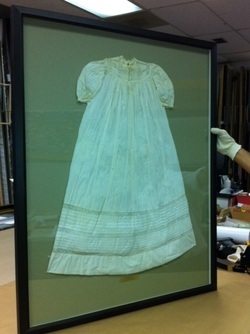 100+ year old christening gown worn by three generations of the same family. How special. At our shop, all customers are welcomed to contribute to the final project. In this case, 10 year old Austin spearheaded the design of his signature piece. 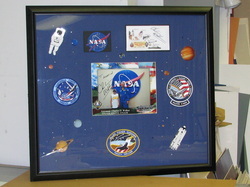 Astronauts, space shuttles, patches,planets and stars were featured in the project. We didn't want to make it like a child's poster, but a piece he'd be still proud to hang at college, his bachelor pad and in the family room of the home he would share with a wife and children. 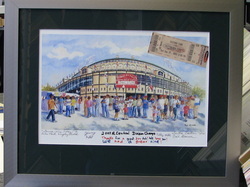 Family fun, Cubs momentos made to last a lifetime. This family was celebrating a birthday and a great Cubs Game. 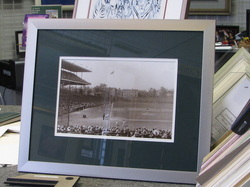 The pieces were a photo of Wrigley Field in 1934 and an original drawing done in honor of the patriach's birthday and a great game!! !